The Los Angeles Dodgers are still alive. With a little hustle, a little power, and a little help from an anemic St. Louis Cardinals outfield, LA managed to avoid a 3-0 situation at home. That said, their odds have only marginally improved. As you can see, the Dodgers are still only 3:1 to win the National League pennant and 9:1 to win the World Series. 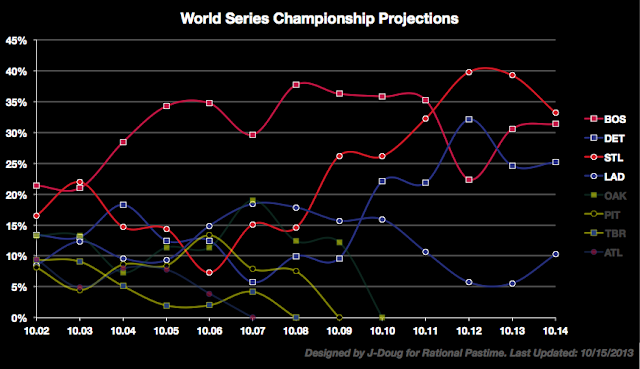 The Cardinals' hopes deflated slightly, but they still lead all other teams in league and world championship probability (at 1:3 and 2:1, respectively). The Dodgers victory was good news for the Boston Red Sox and Detroit Tigers, both of whom saw their World Series chances tick up by about one percentage point. Check out LCS breakdowns and likely World Series outcomes below. 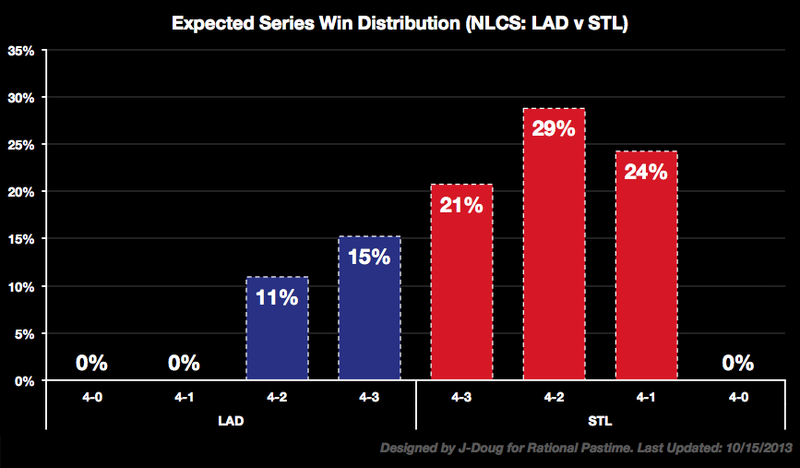 The Dodgers' most realistic hope to advance is still a win in seven games. And while the Cardinals are no longer likely to sweep, they're still expected to win in six. Should Los Angeles force a Game 7, the simulator still picks St. Louis to advance. Just a reminder for today's ALCS matchup: the system still picks the Red Sox to win, but the Tigers are in a much better position than they were at the beginning of the series. 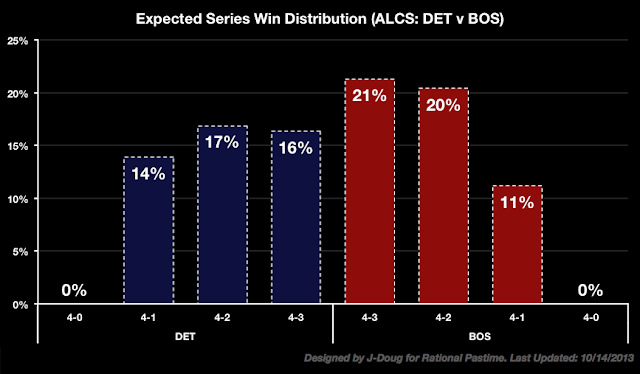 Detroit's most realistic bet is a win in six; Boston's is a win in seven. Despite St. Louis slipping to 2-1 in the NLCS, they still appear in the top thirteen likely World Series outcomes, winning six of them and losing seven. 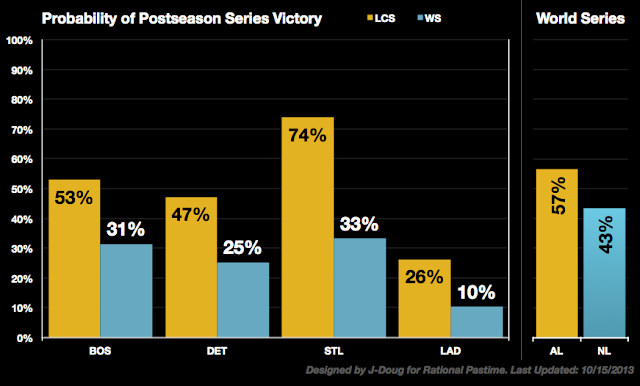 The most commonly expected outcomes remain Boston over St. Louis in six or seven. The Cardinals loss knocked them down to #3 on the Elo-based ratings board, behind Detroit. Los Angeles still lags the rest of the pack. Check back tomorrow to see how tonight's ALCS and NLCS matchups affect each team's chances. There are big changes in store for tonight!